Alexis shows his understanding of pairs of words that were asked in the recent word-study test. I had asked him to paraphrase his writing , to explain the difference between refugee and an immigrant and the most positive and most negative of the words students have been exploring. Alexis chose arrival and alien as the two extremes. Note that when Alexis looks down, he is glancing at the questions only- not his writing nor prepared notes! I was interested in Alexis’s slight slip in saying the root of arrive is ‘riva’ rather than L. ripa. This seems to echo what happened as the word became assimilated from Latin into French and from there to Anglo-French in its ‘migration’ to England. See Online Etymology Dictionary: Arrive and riparian. The /v/ is a voiced labio- dental fricative (lower lip lightly against upper teeth) and the the voiceless partner /f/ also a labio-dental fricative. However, both /p/, and/v/ are close in terms of the place of articulation. /p/ is a voiceless bilabial plosive ( both lips involved in the production and aspiration following release) . This helps explain the cognates : Greek eripne “slope, precipice;” Old Norse rifa “break, to tear apart;” Danish rift “breach,” Middle High German rif “riverbank, seashore;” cf. riven, rift, rifle). Alexis while recognizing the ‘otherness’ of alien uses it more in the specialized sense of extra-terrestial and not of this world. I must show the class the other senses carried by the word as listed in the OED. I am impressed by Alexis’s ability to articulate his understandings of these words ‘on the spot’. 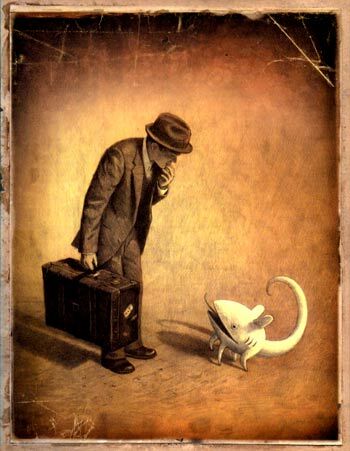 The image above is the cover from Shaun Tan’s brilliant, apparently tetxtless novel The Arrival , an illustrated narrative that focuses on belonging and not belonging, on identity and loss of identity.The cover shows a man with a suitcase as he encounters a strange creature symbolic of all arrivals’ experience in a new land. Tan reveals the new land to be a place where the immigrant must deal with the unfamiliar, in the feeling of being an alien or alienated forom this new world, this world where familiar reference points and landscapes are removed. Tan explores the experiences of the immigrant, the stranger and through his eyes the places where the ordinary becomes extraordinary and therefore alien.